During festivals corporates and brands make great efforts to release ads which make a good connect with the audience and at the same time bringing out a product feature. 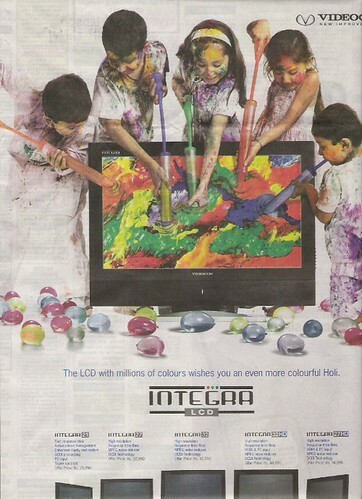 During this Holi, I picked out this ad by Videocon which caught my attention. It’s a well thought idea and beautifully executed. Brings out the wishes and also displays the product feature very well. Yes, very interesting ad! Good execution as well! Would be great if you can keep posting interesting ads like this!